These are an environmentally friendly alternative to plastic seat covers. The covers are made from reusable, recyclable, non-woven polypropylene which reduces waste and landfill. They are non-porous, chemical resistant, are completely re-usable and can be cleaned after use. 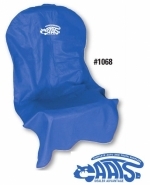 Premium Seat Cover is made of high quality, non-woven polypropylene material, packaged 1 per pack.